FDick Sticking Knife with custom made leather sheath/cover. 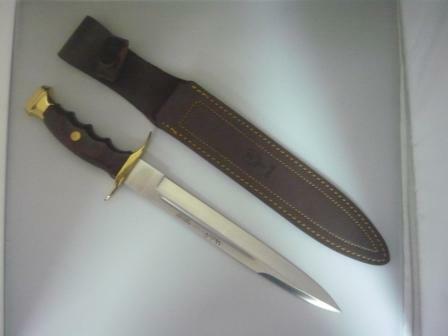 This is a 8 inch double edged blade, made from high grade stainless steel, comes with a custom made leather sheath. Firehose Knife Sheath Only Suits Muela and Fdick Sticking Knives. Will Suit A Blade 20cm Long and 2.5cm Wide. Leather Knife Sheath Only Suits Muela and Fdick Sticking Knives.